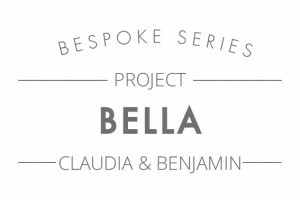 BRIEF CRITERIA: Claudia and Benjamin wanted to create something elegant and classic for their wedding stationery, along with the request that the invitations had a unique and luxurious wow factor. The theme ‘Italian Chic’ was selected by the couple to capture the essence of Claudia’s Italian roots. THE RESULT: Firstly a monogram was created using the bride and grooms initials which became their ‘stamp’ throughout the wedding. 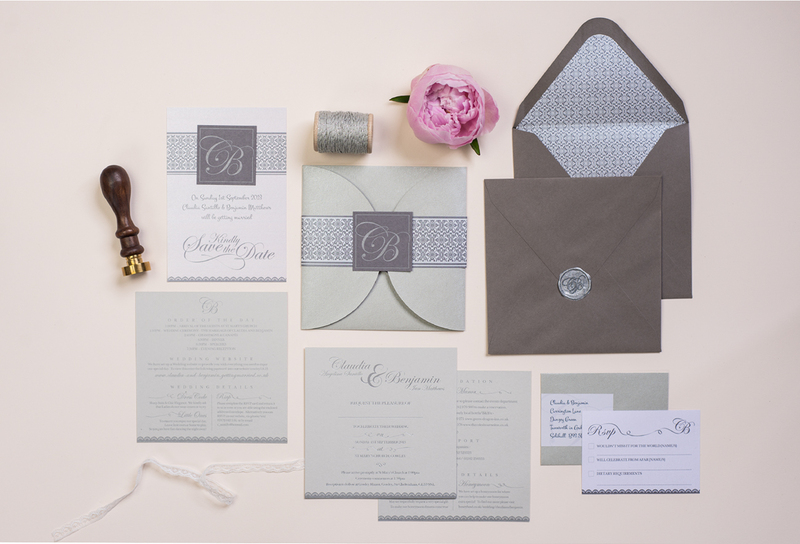 The monogram was then letterpressed onto a luxury smoke-coloured cardstock and made into mini-cards. 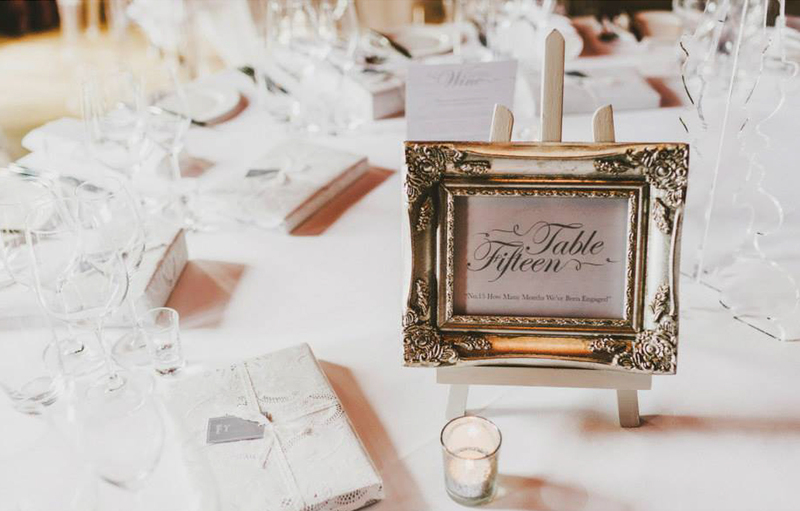 These were used initially on the save the dates to give a taster of the stationery and then also on the main wedding invitations creating an intriguing opening for the textured pouchettes, in which the stationery was placed. 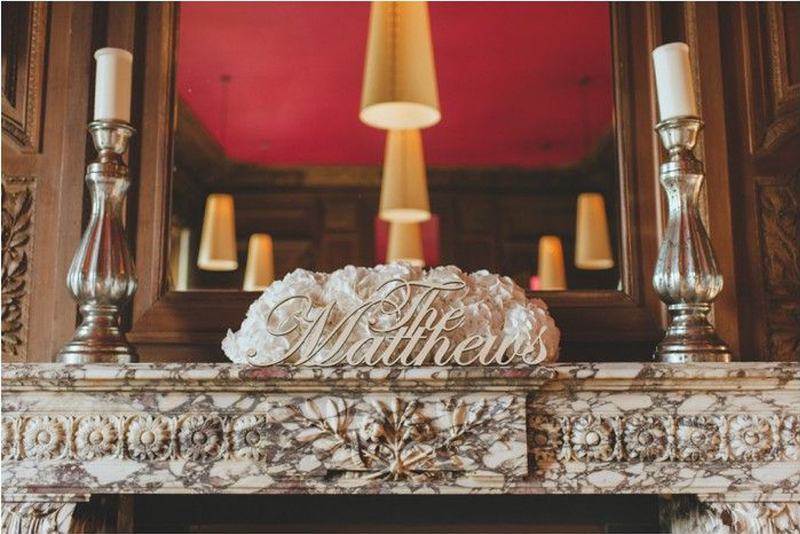 Once the pouchette opened out, individual guest name tags were tied on with a delicate lace ribbon. A silver glitter twine threaded through a small ‘pull here’ tag indicated how to retrieve the invitations from the pack. 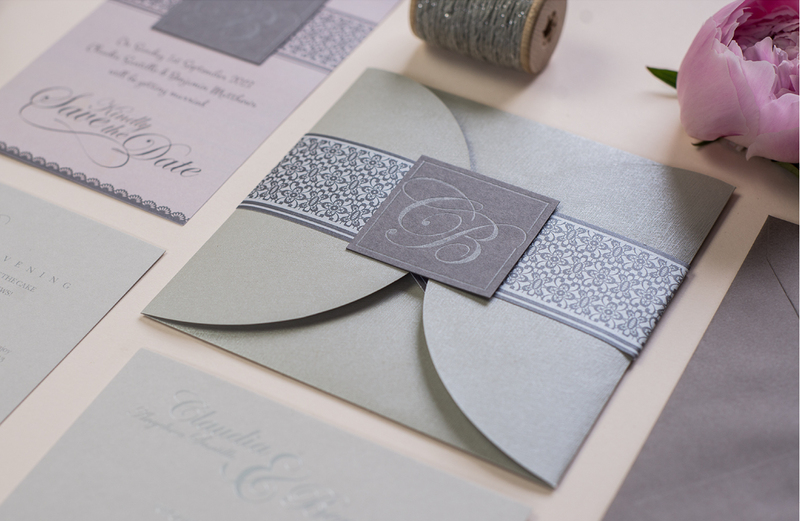 Wrapped within the twine were silver foil-blocked invites printed on a muted grey cardstock. 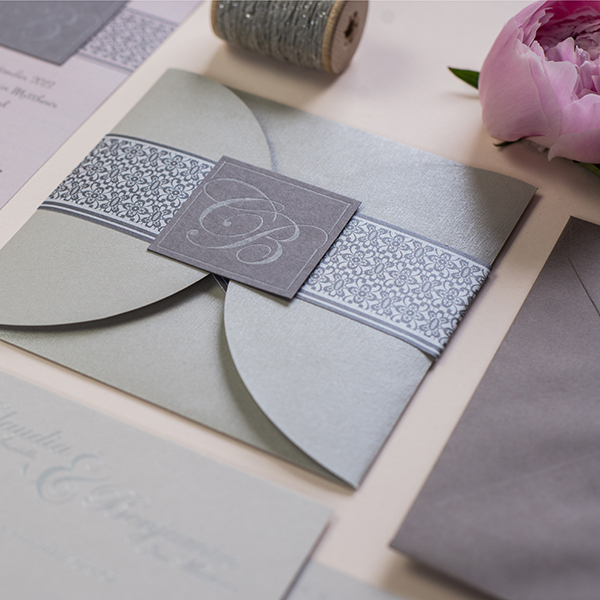 The contrast between the silver and the grey and the metallic and the matt added subtle opulence to the designs. 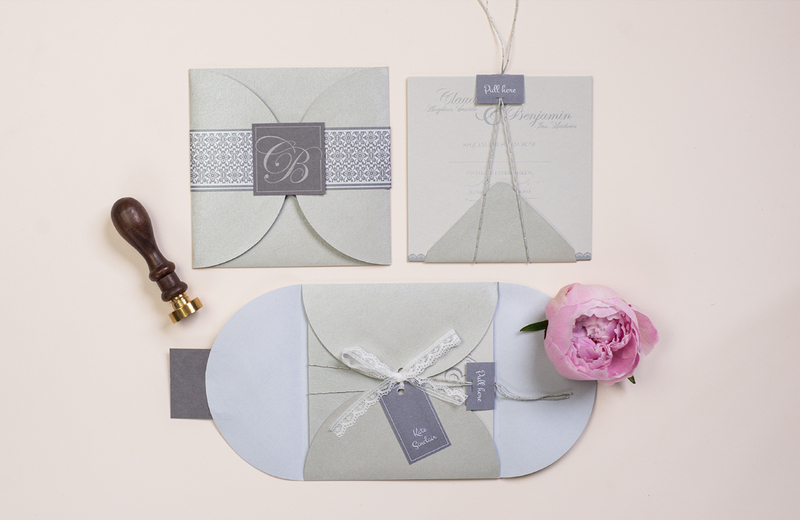 Matching envelopes with pearlescent linings were produced and the couple also opted to have a rubber stamp created so they could seal the envelopes with a traditional-style wax seal. 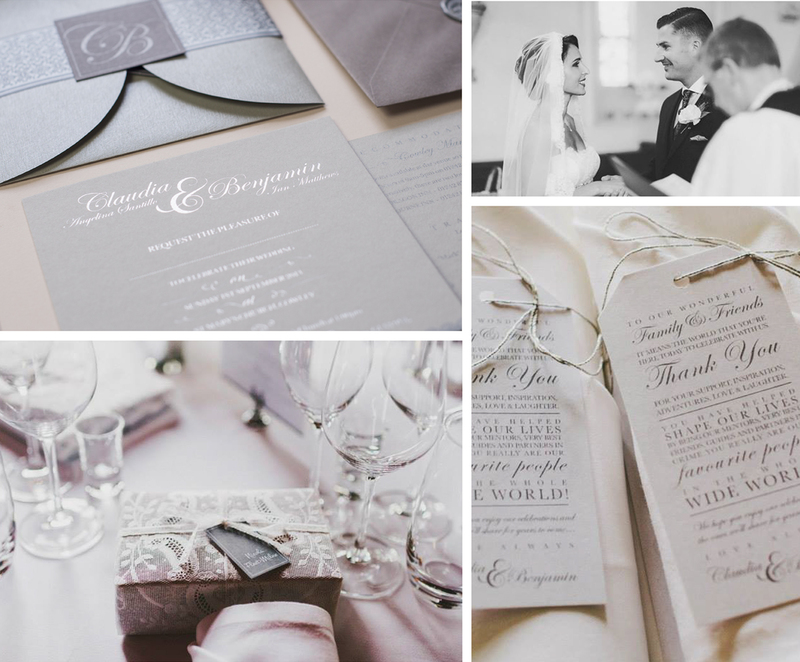 Items for the day were also created following the same design style and using matching materials and print finishes.